One of the greatest modern-day astronomers, the late Carl Sagan stated: “Vedic Cosmology is the only one in which the time scales correspond to those of modern scientific cosmology”. Sagan was an atheist, so religion didn’t influence his findings. Another astronomer corroborated the accuracy of the Vedas by stating that the movements of the stars calculated 4,500 years ago, does not differ by a minute from the tables of today. While scientists have growingly come to acknowledge the Vedas, the basis of Hinduism and Hindu culture, it is our own ‘Fiberal’ Social Scientologists and the ‘Fiberals’ in the media who often heap the most abuse on Hindus and Hindu culture. Some are even ignorant which “invented” religions started the concept of killing for their faith. Rajdeep Sardesai is a family-man. 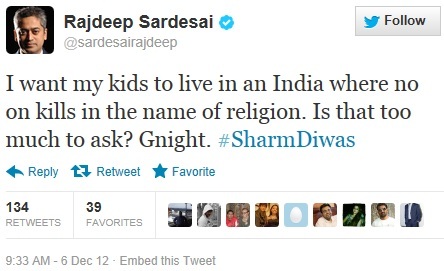 Like any parent he wants his kids to grow up in an India where no one kills in the name of religion. It’s a nice thought. John Lennon did ask to “Imagine no religion”. But what does Rajdeep have to say to parents who often shower abuse in public with statements like calling Lord Ram a “Divine Encroacher”? What does it teach children when someone calls “Indian males ugly”? What does Rajdeep say when a fellow media crook calls Ram a D***? What does it say about an Editorialist who runs an anti-Hindu channel? What does it say about Editorialists who didn’t report a single communal riot of the NINE in UP in the last 6 months? If Rajdeep wants an India free of religious violence he and his friends in the media must acknowledge that religious-violence wasn’t invented in India. It came from foreign deserts. Rajdeep’s deputy called people on SM “Internet Hindus” as a derogatory term. What does Rajdeep have to say? Well, far from feeling offended Hindus now wear that term as a proud badge much to her annoyance.